The Alaska-Yukon-Pacific Exposition (AYPE) was a world’s fair held in 1909 on the campus of the University of Washington in northeast Seattle. After the move of the university to its present site in 1895, the AYPE of 1909 was the event which did the most to cause the opening and growth of new residential areas in northeast Seattle. This blog post will tell about the effect of the AYPE upon the growth of northeast Seattle, when real estate developers hoped to capitalize upon the publicity of the AYPE to help them sell house lots in new neighborhoods. Students of Seattle history can recite dates of major events which caused population increases in the city, such as Seattle’s Great Fire of June 6, 1889 and the Yukon Gold Rush of 1897. As of the census of 1880, Seattle had been in existence almost thirty years, but it was still struggling and was more of a village than a city. The 1880 population of Seattle was 3,533 with a total in King County, including Seattle, of 6,910 people. In contrast, Walla Walla had 3,588 with a total population of 8,716 in that county. As of 1880 it remained to be seen which community in Washington Territory would ultimately achieve dominance. 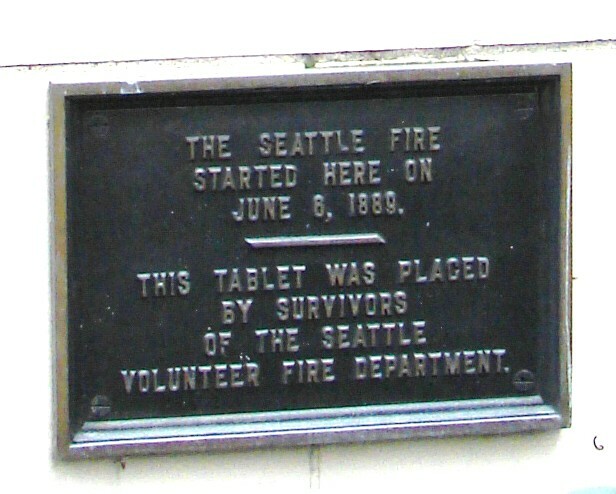 There is a memorial marker for the Seattle Fire of June 6, 1889, placed on the old Federal Building at 1st & Madison Streets. Everything changed with Seattle’s Great Fire of June 6, 1889 which destroyed a swath of Seattle’s business district but which caused the rebirth of the city and an enormous growth spurt. People from all over the USA came to get in on the rebuilding because they knew there would be plenty of work available in Seattle for everyone from merchants to tradesmen. By 1890 Seattle’s population had soared to 42,800 people, greater numbers than all other communities in the new Washington State. Similarly during the Yukon Gold Rush of 1897, people came to Seattle to get in on the economic opportunities of Seattle as the jumping-off place to the gold fields. Many people realized that the real money to be made was not out at the gold fields but was in marketing, maritime and manufacturing industries in Seattle, where merchants supplied the miners. By the year 1900 Seattle’s population had nearly doubled again and was at 80,671. 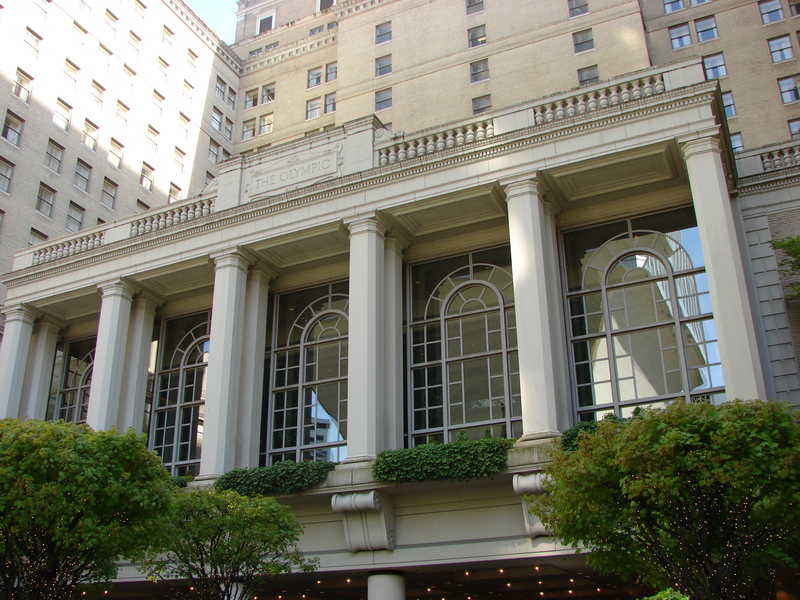 The Fairmont Olympic Hotel at Fourth and University Streets in downtown Seattle is on the original site of the University of Washington, founded in 1861. As a result of the sharp population growth and expansion of downtown streets in Seattle after 1889, City officials realized that there was not going to be sufficient space for the University of Washington at the site where it was founded in 1861, at Fourth Avenue & University Streets (present site of the Fairmont Olympic Hotel.) The decision was made to find another campus and move the university. Washington State laws had designated that according to the land survey system, Section 16 of each township was to be set aside for schools. This meant that a school could be built on that site or the school could sell the land to get money for building elsewhere. The present site of the University of Washington is in Section 16 of Township 25 in northeast Seattle, and that is how the decision was made to move there. Section 16 is bounded on the north by NE 45th Street and on the west by 15th Ave NE. Today there are commercial buildings along the west side of 15th Ave NE, including the University Book Store, across from the UW campus itself. 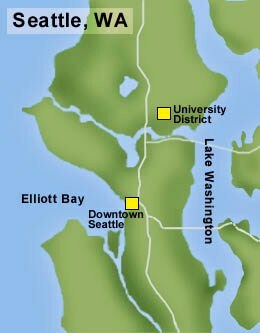 Map of the location of the University District in Seattle. By Chris Goodman, courtesy of HistoryLink. Even after its move to northeast Seattle, the University of Washington did not grow very fast, partly because the state legislature refused to designate money for campus buildings. As of 1898 the student body was less than 200 including some who were there for a high school completion course. The event which led to the growth of the university, including landscape development and architectural layout of the campus, was the Alaska-Yukon-Pacific Exposition of 1909. In searching for a suitable fairgrounds which was not too far outside Seattle, the Exposition Company chose the UW campus. In a three-year frenzy of development, both the campus and the surrounding district were built up to accommodate the AYPE in time for its opening on June 1, 1909. 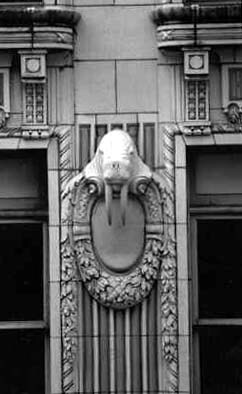 The Arctic Building at the northeast corner of Third & Cherry in downtown Seattle was built in 1916 for the Arctic Club and is now a hotel. Seattle Chamber of Commerce leaders had been thinking of having a 1907 celebration to commemorate the tenth anniversary of the Klondike Gold Rush of 1897. It has been said that the gold rush put Seattle on the map, because business boosters successfully convinced the world that everyone had to come to Seattle as the jumping-off place to the Yukon and Alaska. Seattle leaders thought that a tenth-anniversary event would again help them advertise Seattle’s businesses and services such as international trade, shipping and travel. In 1905 the city of Portland, Oregon, held a Lewis & Clark Centennial Exposition, and a representative from the state of Alaska was sent to exhibit some products of Alaska at the Expo. On the way, this man stopped by in Seattle and met with Seattle’s Chamber of Commerce. The man complained that he had not been given enough time to gather as much Alaska info and exhibit items as he would have liked, and he proposed to the Seattle businessmen that they plan a fair to highlight Alaska. As of November 1905 the Seattle Chamber of Commerce agreed to start the planning process for such a fair. Many of the Chamber of Commerce businessmen of 1905 were also members of Seattle’s Alaska and Arctic Clubs and had personal experience with the gold rush of 1897. In May 1907 an official Exposition Company was formed (a committee of the Chamber of Commerce) and they announced that the fair’s scope would be widened to highlight Seattle’s import-export trade connections with Asia. For that reason the word “Pacific” was added to the fair’s title, and was meant to include the active, already-established trade with Hawaii, Japan, the Philippines and other ports. Soon after the Alaska-Yukon-Pacific-Exposition planning process began in 1905, it was learned that there was going to be a fair in Jamestown, Virginia, in 1907 for the 300th anniversary of the first permanent English settlement in North America. The Seattle Exposition Company’s original intent was to hold a fair in 1907 for the tenth anniversary of the Yukon Gold Rush, but the planners knew it would not be beneficial to compete with other fairs in the same year. Truthfully, it really would have been too much of a “rush” to plan and execute a fair by 1907, so the wise decision was made to set June 1909 as the date of Seattle’s AYPE. This date allowed for commemoration of the time since Seattle’s Great Fire of June 6, 1889 and the entry of Washington as a state in November of that year. The AYPE open dates were set from June 1 to October 16, 1909. 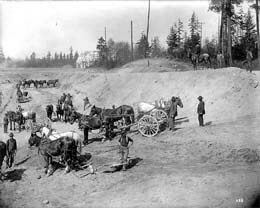 A crew using horse-drawn grading equipment prepared the grounds of the AYPE on the UW campus, Seattle, in 1908. Photo by Frank H. Nowell, UW Special Collections Image Number AYP522. In the era before the invention of radio, TV, and the Internet, the importance of “worlds fairs” cannot be overstated. A fair was the best way to highlight places and advertise products. Fairs were a destination-event for businessmen and tourists, and newspapers from around the USA would cover the fairs extensively by sending their reporters. Seattle’s AYPE organizing committee hired people with experience at other fairs, such as Frank Merrick, who became the AYPE’s chief of publicity. His experience told him what would attract visitors, and in advance of the fair he cranked out press releases which were sent to other newspapers nation-wide. In addition to the local leaders, there was an international group of world’s fair experts who were hired to help organize and run the AYPE. One of the men, H.B. Hardt, was a specialist in arranging exhibits, whether of a state’s or business organization’s products. He was one of those who came for the fair and fell in love with Seattle, and after his involvement in the AYPE work, Hardt settled permanently in Seattle. Two of the AYPE organizing-committee members were sent to the Jamestown, Virginia Expo in 1907 with an exhibit about Seattle as the Gateway to Alaska. One of the men dressed as a Klondike miner and showed how to pan for gold. The other man handed out literature about the delights of Seattle and the coming AYPE, and the travel routes to get to Seattle. The men also succeeded in getting rail lines and steamship companies to set up AYPE promotions and travel packages for tourists. All of the advance planning and publicity that was done for two years prior to the fair, paid off in a better preparation for the AYPE. Like other fairs, Seattle’s AYPE would have representation of local products and industries and was meant to attract businesses, investors and tourists. It was anticipated that not only would people come from all over the USA to visit the AYPE in 1909, but also that some people would choose to move to Seattle permanently. This effect started to happen in the years of preparation for the fair, especially in the areas of real estate sales, residential and hotel construction. Before the AYPE the University District had been known as the village of Brooklyn, platted in 1890 and promoted by well-known Seattle real estate developer James A. Moore. As of the 1890s the Seattle, Lake Shore & Eastern Railroad traveled past Brooklyn and the university campus on its way eastward to the sawmill at Yesler on Union Bay, and then on to Lake Washington, the same route now followed by the Burke-Gilman Trail. 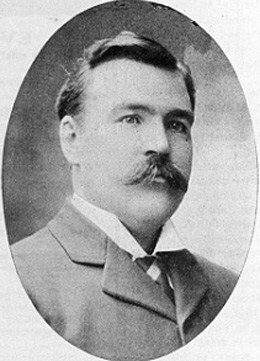 In the 1890s more streetcar lines were being built to Brooklyn but construction ended in the economic depression of 1893 when the streetcar line investor, Seattle’s pioneer David Denny, went bankrupt. Brooklyn remained a village until the the AYPE vaulted it into prominence. Suddenly streetcar lines began to be built again, and water mains, sidewalks, streetlights and paved streets were put in around the district. House lots in areas adjacent to the UW campus began to sell like hotcakes prior to the AYPE and many more residential areas were platted, including Laurelhurst and expanding out to Ravenna-Bryant. Real estate developers such as the McLaughlins from Detroit arrived in Seattle to get in on the AYPE boom. The McLaughlins platted Laurelhurst in 1906 and did other developments around the city, including the Earl J. McLaughlin plat in Wedgwood in 1907. To the northeast of University Village and Union Bay Place is the Exposition Heights plat by Crawford & Conover Real Estate. Local real estate men had the advantage of long-time contacts in Seattle and a better sense of what was likely to sell, and they filed plats as near to the university as they could. 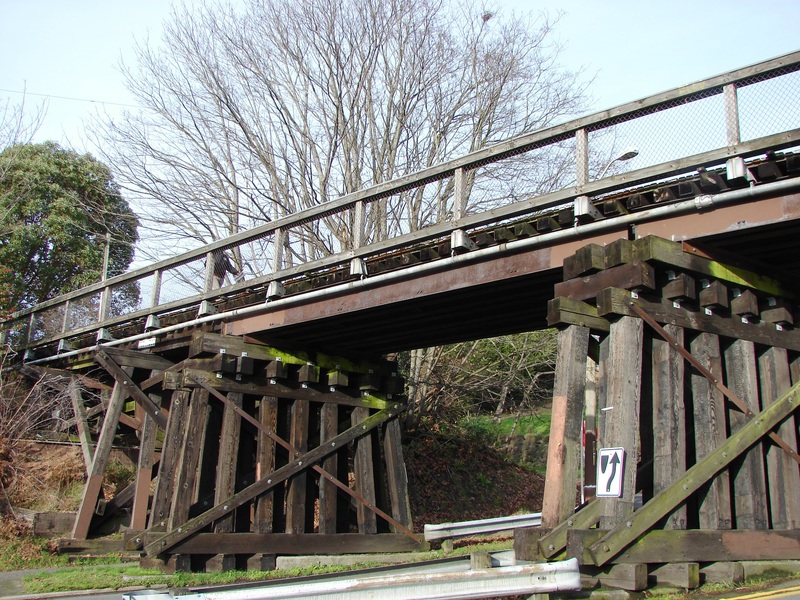 Crawford & Conover who had done business in Seattle since 1888, filed the Exposition Heights plat in 1907, located east of Union Bay Place on the other side of the railroad trestle. Village-of-Brooklyn developer James Moore was still active in 1906 and he began to file plats in areas adjacent to the university campus such as just north across NE 45th Street, which he called University Park. The neighborhood west of 15th Ave NE had been platted as Brooklyn in 1890. The “villagers” of Brooklyn (in Section 17 of Township 25, just west of the present university campus) had succeeded in annexing themselves to the City of Seattle in 1891, along with Green Lake and the southern part of what is now Ravenna, which all had thriving residential communities in the 1890s. By 1891 it was known that the Washington legislature was in favor of Section 16 become the new home of the university. While there were only a few buildings at first, by 1895 when students moved to the new site, the name “University District” was already coming into use. An elementary school for the district was built in 1902 at 5031 University Way NE and was named University Heights. By 1907 the University Heights enrollment (grades 1 through 8) had jumped to 500 students, showing the influx of families to the area in anticipation of the AYPE and the increased amount of residential housing. Use of the term “University District” was complete by 1909 when streetcar lines needed to clearly indicate the route for tourists to attend the AYPE. Today, Brooklyn Ave NE commemorates the former name of the neighborhood which faded from use. 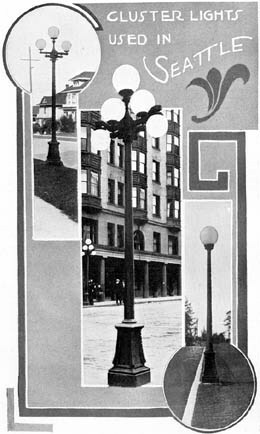 City Light put in streetlamps in 1909. Photo courtesy of the 1911 City Light Annual Report. The preparations for the AYPE set off a frenzy of construction and clean-up, not just in the University District but also along City of Seattle streetcar routes, in commercial development of stores and hotels, and civic resources such as parks. The pergola at Pioneer Square, a symbol of Seattle, was constructed in 1909 to shelter streetcar riders while they waited to get on the line to travel to the AYPE fairgrounds at the UW campus. Many street improvements were made in preparation for the AYPE. City Light put in the first streetlamps which were decorative, but their real purpose was to light the way along streetcar routes. By 1910 Seattle was spreading out in all directions and the list of annexations included far-flung neighborhoods from West Seattle (as far west as you can go in Seattle) to Laurelhurst in northeast Seattle. After the southern part of Ravenna, Laurelhurst was the next northeast Seattle neighborhood to be listed with a definite name and be included within the City Limits of Seattle. All of northeast Seattle finally came into the Seattle City Limits in 1954 when the north city boundary was set at 145th Street, as it is today. The census of 1900 had used the designation of “Yesler” for all of northeast Seattle, because there were no other neighborhood names in use outside of that sawmill settlement which later became Laurelhurst. In 1900 there were no large residential neighborhoods or groups of people living northeast of Brooklyn (the University District) and Ravenna except for some people at the brick plant at Pontiac-Sand Point on Lake Washington, and at the Village of Yesler on Union Bay. By 1910 the census district of northeast Seattle was called Union and a few hardy types, willing to live without electricity or running water, were living out toward what is now Wedgwood and Meadowbrook. 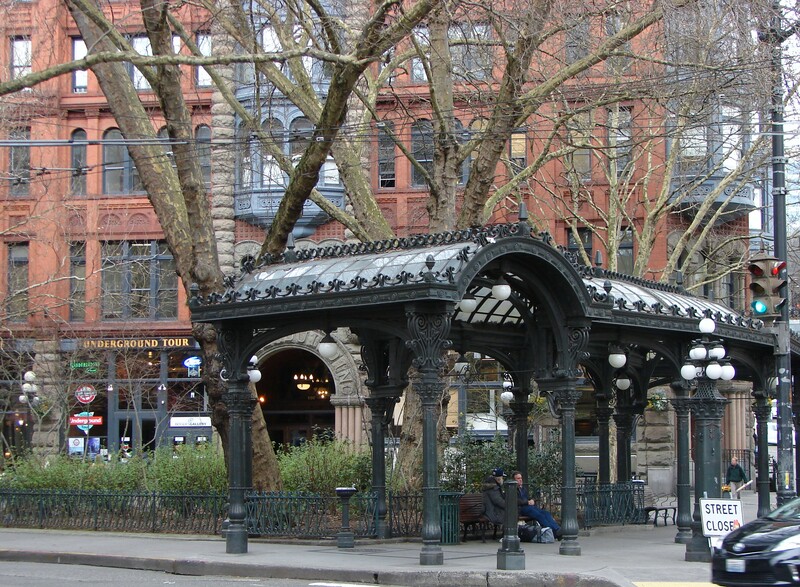 The sheltering structure of the Pioneer Square pergola was set up in 1909 for people waiting for the streetcar out to the Alaska-Yukon-Pacific Exposition. In 1900 the population of Seattle had been 80,671 people. In 1910, after the AYPE, the population of Seattle was 237,194, an increase of 194 percent. We can’t know for sure how many people first came for the economic opportunities of the AYPE and then decided to stay in Seattle, but there are some examples of people who did, like H.B. Hardt the exhibits manager. Another who visited the fair and then stayed, was Gerda Engvall, a Swedish immigrant. The Jenkins-Wilson families came prior to the fair because they sought better jobs and the opportunity to invest in real estate in Seattle. Alaska-Yukon-Pacific Exposition: Washington’s First World’s Fair – A Timeline History, by Alan J. Stein, Paula Becker and the HistoryLink Staff, 2009. Seattle Public Library 979.7041. A Ton of Gold: The Seattle Gold Rush 1897-1898 by David & Judie Clarridge, 1972. Seattle Public Library, Seattle Room reference copy 979.72. Hard Drive to the Klondike: Promoting Seattle During the Gold Rush by Lisa Mighetto, 1988. Seattle Public Library, Seattle Room document DOC 29:58. Seattle 1900-1920: From Boomtown, Urban Turbulence, to Restoration by Richard C. Berner, 1991. Seattle Public Library 979.7772. UniverCity, the City Within a City: The Story of the University District in Seattle by Roy G. Nielsen, 1986. Seattle Public Library 917.9777. Seattle Municipal Archives Quick Information (population figures and other most-often-asked info) and list of annexations of areas which came into the City of Seattle. 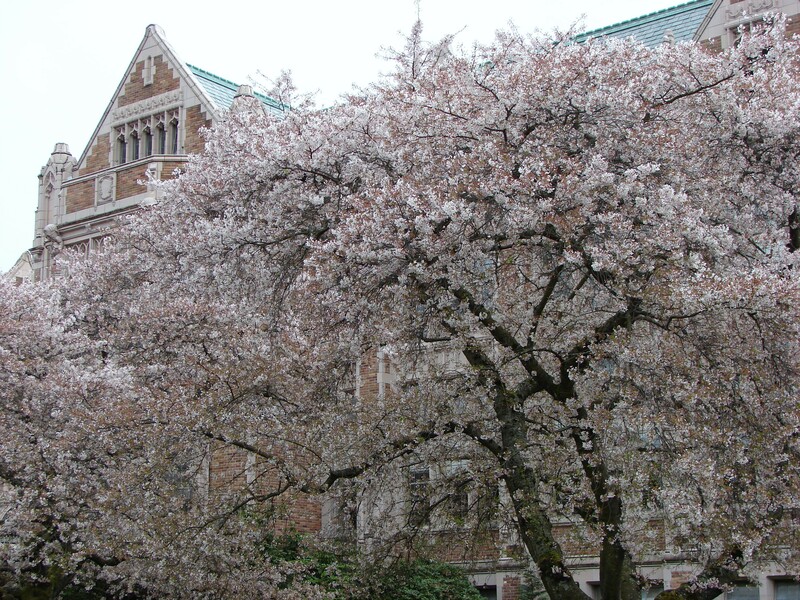 Seattle School Histories – University Heights. The AYPE laid the architectural and landscaping foundation for today’s beautiful campus of the University of Washington in Seattle. Yoshino cherry trees in bloom on the Quad in spring 2015. Special suite of articles about the AYPE. HistoryLink Essay #3380 Seattle Neighborhoods: University District – Thumbnail History by Paul Dorpat, June 18, 2001. HistoryLink Essay #3392 Seattle Neighborhoods: Pioneer Square – Thumbnail History by Walt Crowley, June 20, 2001. Seattle developer James A. Moore: HistoryLink Essay #3852 Moore Theater, by Erick L. Flom and John Caldbick, May 6, 2012 and HistoryLink Essay #3188 Seattle Neighborhoods: Capitol Hill, Part 1 – Thumbnail History, by Paul Dorpat, May 7, 2001. This entry was posted in Events and holidays, Land records and surveys, name of the neighborhood, Plat names and tagged annexation, Gold Rush, growth of northeast Seattle, Neighborhood History, Seattle, University of Washington in Seattle, WPLongform. Bookmark the permalink.